So you’ve decided to start a budget. Great! Creating a budget is primarily about math. You have an income which you have to allocate to various expenses – some essential, some not. The goal is to have a budget that balances – so that your expenses do not exceed your income, because otherwise you will go into debt. Pretty simple, right? In theory, yes. In practice, not necessarily. It can get confusing and frustrating. So I wanted to share with you how I create a budget. This is what I’ve determined to be the best based on reading what financial experts say (I’m always reading financial advice books to learn new and better ways to manage my money) as well as my own personal experience (trial and error). One thing that I’ve read in many financial advice books is that you should track your spending for X amount of days before you create a budget in order to see where you spend your money. I disagree – unless you primarily spend cash, there is no need for this. In this day and age of electronic statements and real time updates, all you need to do is download the last 6 months to a year of bank and credit card statements and you will have a much clearer picture – one that is true to your actual spending habits and will catch all those expenses you don’t think about (bank fees, interest, any direct debits etc). So here we go. I like to follow a monthly budget the most, since many recurring expenses are monthly (mortgage, car payments, insurance etc). I’ve included a budget template below which can help you get started and where I go into more details on categories. When you are filling out the budget, I think its a good idea to start with what you REALLY spend in certain categories just to get an idea of what you are spending your money on and then tweak it afterwards. It might be eye-opening (those daily coffees may seem cheap at $3 a pop, but that does come out to over $90 /month and over $1,000/year) or you might look at it and say, yup that’s about right! So many people mistakenly take their annual salary, divide by 12 and think that is is their monthly income. Its NOT. What you need to do is use the cash you get every paycheque to determine your income. This is net of taxes as well as other expenses (your portion of health insurance at work etc).The best way to figure that out is to look at your bank statement. If you get paid bi-weekly, take that amount, multiply by 26 and then divide by 12. If you get paid twice a month, take the amount and multiply by 2. Ex. You are paid bi-weekly $2,127 in to your bank account. $55,302/12 = $4,608 –> this is your NET monthly salary, and your starting number. If you don’t have a set salary, but make commission or charge for services (say you are a massage therapist, real estate agent or photographer etc) then this is going to be more difficult – you need to determine what you actually earned net (after considering taxes, overhead costs etc) and what portion you want to “pay yourself” and what portion you want to keep within your business. However, you can figure this out by going over your bank statements and come up with what you take home on average (I think a year would be the best, but 6 months should be enough unless you have very seasonal work) after paying your taxes and business expenses. I will be doing a post on running your own business and will include a general business template to help you determine what your income is and how to manage your cash flow. However, there are some things you should NOT include in income – anything you haven’t earned yet or that isn’t guaranteed (like a bonus) shouldn’t be part of your budget. If you do end up getting a bonus or gift of cash, use it to pay off a chunk of debt, boost your retirement fund or even put it towards a vacation or whatever you and your family want. I have come up with four main expense categories and have allocated what I believe is a reasonable amount of my budget for each: Housing & Fixed, Utilities, Transportation & Food, Future and Life. Housing expenses are those expenses required to put a roof over your and your family’s head. They are mortgage/rent, property taxes, condo fees etc. Essential fixed expenses are expenses that don’t change month to month (like insurance, childcare) and that you are obligated to to meet and that you need. These you should easily get from your bank statement. Again, if you pay any of these bi-weekly simply multiply by 26 and divide by 12 to get your monthly average. This is my category for essential variable expenses – things that you can’t get away with not spending money on though they are not all necessarily fixed. You should have a good idea of what your utilities are – just take an average of what you spend in the past 6 months to a year and use that as the amount. I include things like tv, internet and home security in this category. Your food budget should be your groceries. I don’t include restaurants or any kind of eating out in this category. Transportation includes car payments, gas costs, public transportation costs, parking, tolls etc. While car payments are a fixed cost, I put them with transportation to make it easier to see how much is going towards overall transportation costs. The future category is for debt repayment and various types of savings. Most financial experts recommend having a few different types of savings – emergency savings, long-term savings, retirement savings and education savings for your kids. Emergency savings should be for true emergencies – such as a job loss or medical emergency which would cause you to be unable to work (so not for expected or routine house maintenance, like replacing a leaky roof). This amount should be enough to cover your essential living costs, like housing, basic utilities (cable doe NOT count) and food for about six months. You should make this category a priority. Next would be retirement and education savings. Lastly, I would set up a savings account for long-term wants and needs (like a vacation, new roof, down-payment for a house etc). The debt repayment category should go to pay off any credit card debt, line of credit and, if you have no other debts, additional mortgage payments. Now, this amount should NOT be whatever your minimum balances are – the amount you are paying should be 10 to 15% of your overall budget. If your minimum balances are greater than 15% of your total budget however, you have a serious problem – I’ll address what to do in this case at a later date. Once you deduct all the financial obligations from your income, the amount remaining is what you have left over for all those other expenses for life, such as entertainment, kids activities, clothes, gifts etc. You can further subdivide the Life category into smaller categories, such as if you want to make sure you have a specific amount allocated for your kids activities or recurring medical costs (prescriptions, orthodontics) or even a set amount for yourself and your spouse (so you don’t feel guilty about that manicure or expensive haircut and he can indulge in that movie collection). When my husband and I were doing a lot of home renovations, we also had a Home Renovation category to which we allocated a portion of our Life budget because we wanted to pace ourselves and not let the house renovation leave us with little to live on. Once you have put your figures into a spreadsheet or done the math on paper, there are a few things you need to do. YOU have to decide what is reasonable and works for you. Your grocery budget may be high but if you mostly buy organic, and that is a priority for your family, thats ok, as long as you aren’t skimping on savings or paying down debt. That said, there are some things you should keep in mind though. If you are overspending, you need to cut back. Start with the stuff you can control and that is completely unnecessary – manicures, eating out and yes, organic food. See if you can get out of any commitments or lower your packages (reducing your cable to the most basic package, increase your deductible to get a lower insurance premium etc). However, make sure its realistic – you need to be able to stick to this budget. If you have a family of 5, but budget $200 a month for groceries, you will very likely go over budget every month, which defeats the whole purpose of it. Also, you need to have some sort of budget for fun – this is your life and you should enjoy it – just make sure its reasonable. Next see if you are saving enough. I can’t stress enough the importance of getting into the habit of saving. I hear from people “I’ll save once my debt is paid off” or “I have plenty of time to save later, I’d rather have fun now”. Getting into the habit of saving, even if you have debt, is always a good idea – if you wait until your debts are all paid off you may be much older than you expected and what, you’re suddenly going to stop wanting to go on vacation or to the movies? Your habits are suddenly going to change? Even putting aside $50/month is still $600 a year. Its ok if your budget isn’t perfect. 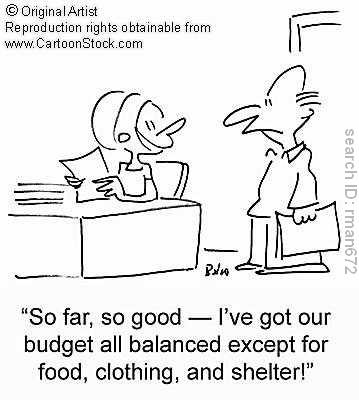 Many people are shocked when they try to do a budget and the reality of their financial situation hits them. Your budget may not hit the recommended targets right away, and thats ok. If you are stuck paying a high rent and can’t get your savings up to the recommended amount don’t stress – but strive towards those recommended budget allocations. You may end up with an unexpected expense that blows your budget and that oks too. Following a budget should be a plan for life, so you need it to be flexible. If one month ends up not going as planned, just dust yourself off and start again. Whew! Next I will be posting about “Sticking to Your Budget” – how best to track it, make sure you stay on track and tips on how to maximize it. The Costs of Not Vaccinating – How “Big Pharma” would benefit if we stopped. Kasia – Thank you for posting the budget template. I found it extremely easy to use and very informative. It’s so helpful to be able to sit back and see where your money is going and to measure it against the recommended targets. Overall – very practical and valuable! Thanks! Thank you! I’m glad you found it useful – I swear by it for me and my family!